This 3D documentary chronicles the Jonas Brothers' Burning Up Tour. Visit StateCollege.com's Movie Section for a list of local theaters and movie times! Local Motion DJ Kid A.V. Tussey Mountain will host the Big Air & Park Jam Friday & Saturday, February 27th-28th. The Rail Jam will take place at 7 p.m. Friday evening with the Slopestyle/Big Air competition beginning at 11 a.m. Saturday. Registration will take place one hour prior to each event in the lodge. Registration is $15 for one event or $20 for both events. Participants under 18 must be accompanied by a parent and all competitors must sign a waiver and wear a helmet. The hike will include simple activities on the trail for all ages to enjoy. In case of severe weather, walks will be cancelled. Advance registration is required. The ESCHL Hockey Playoffs will take place Friday-Sunday, February 27th-March 1st at the Penn State Ice Pavilion. The first game will be Drexel vs. Navy Friday evening at 9 p.m. The first semi-final game on Saturday will be Penn State versus the winner of the Drexel & Navy game at 3:30 p.m. The second semi-final game on Saturday will be Rhode Island vs. Delaware at 6:30 p.m. The championship game will be played at 1 p.m. on Sunday. For all games, general admission tickets will go on sale the day of the game. Come out and cheer on the Penn State Icers! 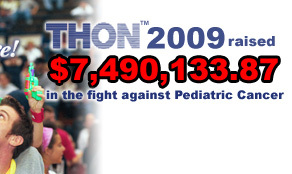 THON raised over $7.4 million this year. Since 1977, how much money has the annual dance marathon raised? One BR, private bathroom! everything included!! 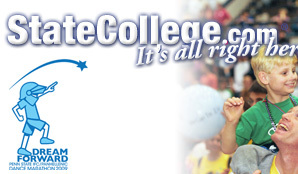 StateCollege.com is viewed by 200,000 unique readers each month. Our Weekly Community Guide E-mail Newsletter goes out to over 38,500 opt-in subscribers each week! Find out how your business can reach this audience.